Like many security solutions from Kaspersky Lab, Kaspersky Safe Kids provides a wide range of protective features, but for children. The software can help you create and control a limited account for children. While using this account, children won't have access to inappropriate websites or any other contents that are not suitable for children or which may cause damage to your computer. Also, you will know exactly what they are doing, while you are away from home. After a brief installation process, you can run the software and let it help you create a child-friendly environment on your Mac. Essentially, the desktop application's purpose is to help you create a limited user account. All you have to do is type a child's name and year of birth, choose an avatar or use a picture from a local folder and name the new account. Of course, the application lets you create multiple accounts for children. All you have to do is click an option to protect another child and go through the same process. Alternatively, you can assign the new user to an existing account. Parental control options can be found on a web-based user interface, which you can access through your Kaspersky online account. Besides restricting unsafe websites, you can also gather reports on their activity, receive notifications if they are about to do something they shouldn't, locate them in real time, if they use a mobile platform and you can also limit the time they can spend on the computer. 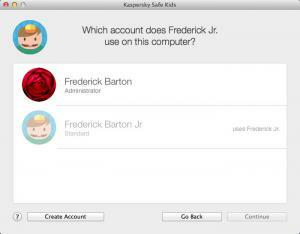 Kaspersky Safe Kids can help you make your Mac a safe environment for children, with nothing more than a few clicks. The application lets you know what your kids are up to, while they use a computer. It lets you assign users to new or existing limited accounts. All the parental control options can be fond on a web interface, so you can keep an eye on your kids even while you are away. There are no obvious design flaws to point out. You can download Kaspersky Safe Kids free here.